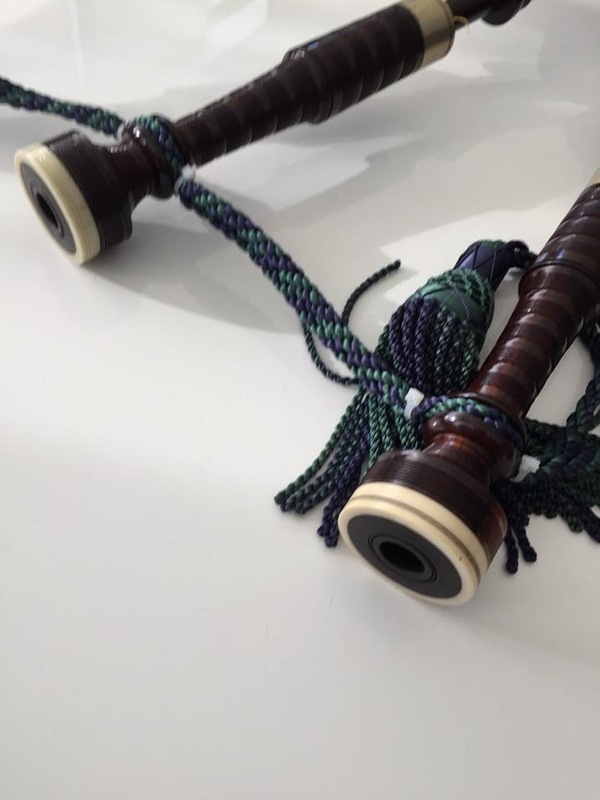 I’ve been playing a set of David Glen & son pipes for about a year and absolutely love them. They sound fantastic. You have quite a bit of experience mucking about with reeds so I’ll be interested in your observations as time goes on. Do you have a preference for drone reeds Ben? I haven’t tried real hard drone reed wise as the bag and chanter have occupied most of my time up until now. I just notice that a lot of reeds shut off when mouth blown, which strikes me as odd. 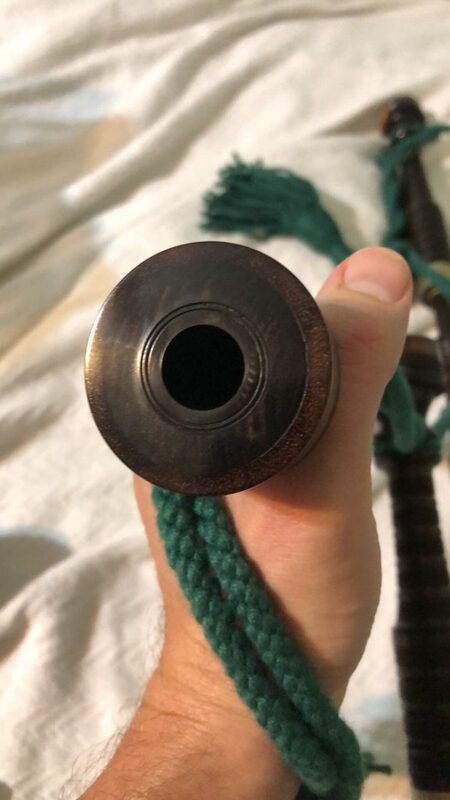 I haven’t tried Crozier cane in a long time for any pipe but I think I will give them a go in this one just for giggles. I’m currently using Kinnaird evos. Which seem to go pretty well. I’ve also used Cannings. I don’t have a lot of different reeds kicking around right now so that’s about it. I’ve had a hard time setting up the tenors so they strike in without double toning. Otherwise, very stable drones and great tone. Mine look just like yours except they have nickel rings. The stamp includes “&sons” and is estimated to date between 1910-1920. Ben, my experience today with a whole slew of drone reeds is identical to yours. I decided Kinnaird were the best sounding and most reliable, though I’m playing the not too different originals. Regarding doubling toning: YES! More than any other pipe, I struggled with having the drones come in properly. If they’re howling on strike in, they never come in or shut off. It has to be perfect. Thankfully, Kinnaird work rather well, though I can’t imagine using them in a band setting at the moment. Mouth blowing the reeds was a useless exercise; they had to be in the pipes for me to observe how they performed. My chanter is just marked David Glen and Edinburgh. I need to do some research on how that ends up dating the chanter. I don’t have an original chanter, my pipes have a stamp on the bass stock immediately under the ferrule. Check with the experts but my information is that ‘& sons’ was added to the name of the company around 1912 and possibly to the stamp a little before that. I’ve got no stamp on the bass stock. Thanks for the date info! Its very interesting to me reading Piping blogs from the other dide of the pond and how your piping repertoires differ totally from “traditional” Bagpipe music. 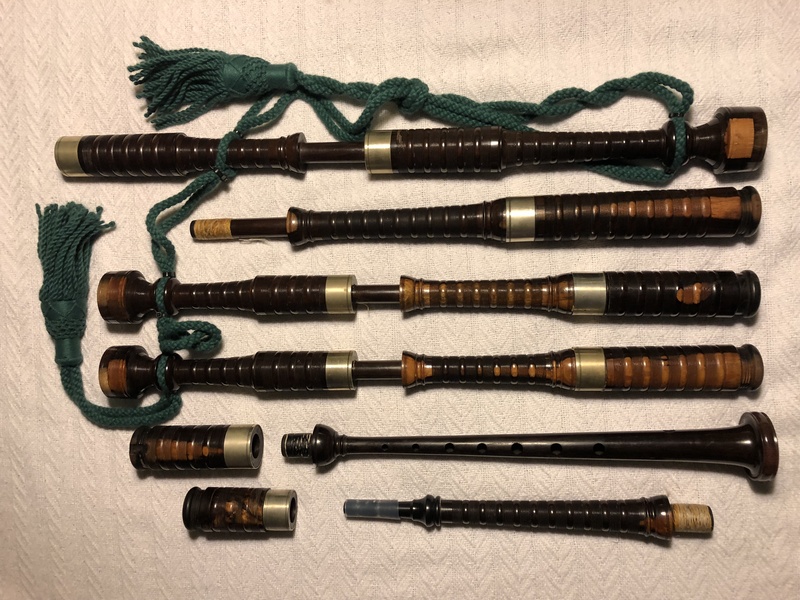 Having been born into a Piping dynasty going way back, I was brought up on traditional and at the time and for many years “Irish” music, after nearly 60 years of playing around the world, l listening to some of your tunes is like listening to a different instrument. Not a criticism, but I found some of the sounds monotonous, I guess because I have a brain that is conditioned to the traditional type of Bagpipe music. 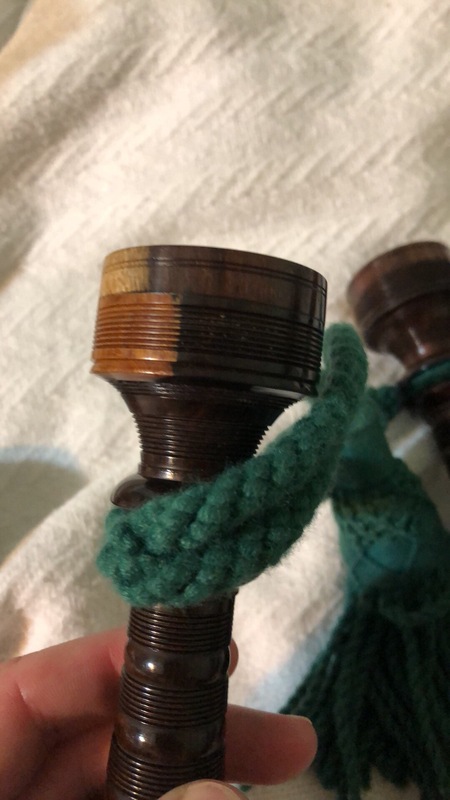 With regards to drone reeds, having been born into the cane reed era and having experimented with most modern drone reeds, I have found that Selbie reed are the next best thing to cane, I have a set of bagpipes that are over 100 years old and tried many reeds over the years, Selbie have definitely been the best so far. Selbie are a fine set of reeds. Having gone through a bunch of synthetics today I don’t remember why I didn’t settle on them in this particular pipe, but generally they are a reliable, universal drone reed. I have played “traditional” Scottish music for quite some time. But it grows monotonous for me and I seek new challenges. Part of my problem is I’m addicted to bagpipes, but it is generally quite limited in its musical capabilities, so I’ve enjoyed seeking out new music on various pipes; it is fun to realize some of it fits back on the highland pipe. I think both you and I have been exposed to quite a bit of this music in the context of ensembles, so perhaps it sounds less interesting now due to the solo presentation?